Springfield Mayor Jim Langfelder makes the case for increasing tax revenue at a Jan. 27 meeting of the Citizens Club of Springfield. Photo by Lee Milner. Springfield mayor Jim Langfelder says he’s willing to consider further cuts to the city’s budget, but he cautions that the cuts may create other problems in the future. Langfelder spoke in response to a proposal released yesterday by seven of Springfield’s 10 aldermen to cut nearly $3.9 million from the city’s budget. The aldermen hope their proposed cuts would decrease the amount of additional revenue the city must seek through tax increases. The City of Springfield is facing a budget deficit of nearly $5 million for the fiscal year that starts March 1. 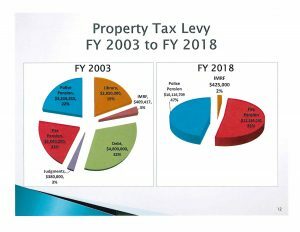 Langfelder attributes the shortage of revenue to a dip in sales tax and a growing bill for the city’s police and fire pensions. 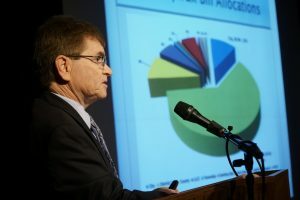 To close the budget hole, Langfelder is proposing increasing the city sales tax from 8.5 percent to 8.75 percent, increasing the hotel-motel tax from 6 percent to 7 percent to fund Oak Ridge Cemetery, increasing the telecommunications tax from 4 percent to 6 percent to fund Lincoln Library and creating a 4-percent tax on natural gas. In response, seven of the 10 Springfield aldermen proposed cuts yesterday aimed at helping close the budget deficit with a smaller tax increase. The aldermen called for saving $350,000 by cutting 2 percent from the city’s non-personnel operating lines, saving $1.1 million by eliminating vacancies and making other reductions, transferring $1.3 million to the city’s corporate fund from City Water, Light and Power, and saving $1.1 million by delaying improvements to the city’s Municipal Center Complex. 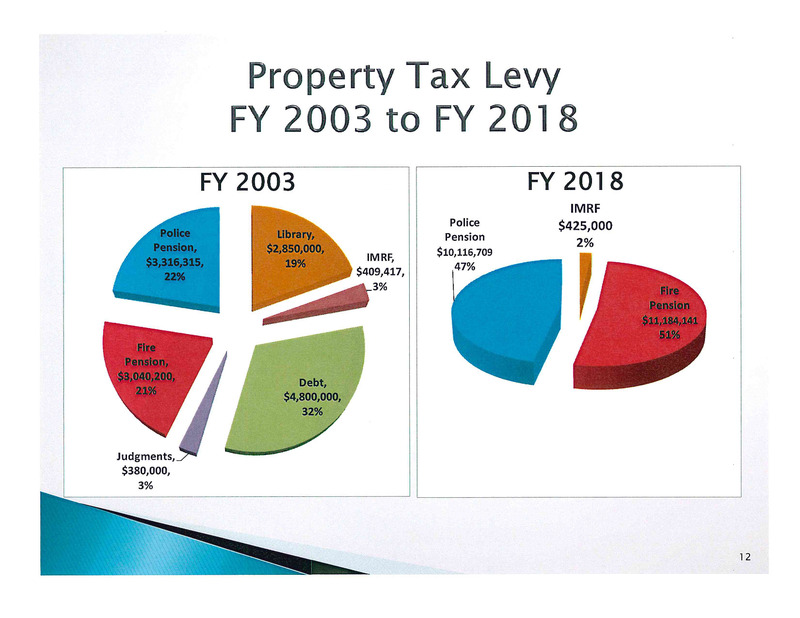 Langfelder uses this graphic comparing property tax expenditures in FY2003 and FY2018 to illustrate the effect of the city’s growing police and fire pension obligation. Langfelder says he’s willing to consider additional cuts, but they may come with complications. For example, he says transferring money from CWLP back to the city’s corporate fund may prompt the bond ratings agencies to lower the city’s bond rating. The city previously rebated $4.4 million in PILOT funds to CWLP to help stabilize the utility’s electric fund, earning an upgraded bond rating. Langfelder says transferring money back may jeopardize the new rating. “It just sends the wrong message altogether,” he said. Improvements to the city’s Municipal Center Complex could wait a year or two, Langfelder says, but delaying that project could add further cost later because of water damage from existing roof leaks. He also says money for that work comes from the city’s capital improvements fund, not the corporate fund that’s facing a deficit. Additionally, Langfelder says he already instructed every city department to propose cuts, ranging from 2 percent to 5 percent per department, so the 2-percent cut to operations proposed by the aldermen would have to be on top of the departments’ proposed cuts. He says the city has already slowed hiring and has been cutting employees for several years. Langfelder cautions that the issues causing the budget deficit will likely persist – especially the police and fire pension obligation, which Langfelder says is growing by about $1 million per year. Still, the mayor says he’s prepared to make further cuts if the aldermen say to.